When I was ten years old, I went to summer camp with my best friend. To this day, that week is memorialized as one of the best weeks of my life. The camp offered a variety of sports, games, talent shows, arts and crafts, swimming lessons and wilderness experiences. There was so much to try for the first time. I was beyond myself with excitement and enthusiasm. Besides the fun activities, every meal in the mess hall and bedtime in the bunks was a time of laughter, songs, pranks and socializing with new friends. Oh and let’s not forget the “cool” counselors who shepherded us through the week’s program; we watched them and wanted to be like them! The summer camp experience can be life-changing. 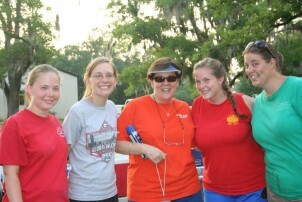 Some years ago, I was the camp nurse for Georgia Lions Camp for the Blind. I was struggling with my own vision loss at the time, but still working as a school nurse. I spent 7 weeks caring for campers of all ages from preschoolers to seniors. It was an inspiring and empowering experience not only for the campers, but for me. I learned so much from observing the campers and playing alongside of them. They had such exuberance and eagerness to try new things like climbing the rock wall and horseback riding. One six year old boy who was totally blind since birth conquered the climbing wall while his mother and camp staff looked on through misty eyes. When he reached the top and rang the bell, he was giddy with accomplishment and exclaimed “Look at me! I’m so high up!” For many campers, it is their first time to be away from home and the watchful eyes of parents. It is the first exposure to many new experiences like canoeing, camp-outs, adapted sports like beep ball and goalball, and tactile arts and crafts. They quickly become a part of “the group” and feel included and accepted, while learning from each other. It is a place where their disability does not make them different. The growth and learning that takes place in a camp setting is invaluable and cannot be replicated. There is often a sort of magical transformation that takes place in a camper. And they leave with powerful memories of being included, succeeding at new activities, tasting independence, and making new friends which can change them forever. Camps that are designed for special needs can accommodate campers in unique ways. The Georgia Lions Camp for the Blind is a visually impaired friendly environment. They use rope lines to help guide the campers to different areas. In the buildings, the wood work is painted in high contrast for better visibility. The pathways are straight, flat and uncluttered. The staff receives training in vision rehabilitation techniques and many are interns or professionals in the field of vision rehabilitation therapy. The program integrates recreation, education, rehabilitation and social development, with a hefty component of play therapy. 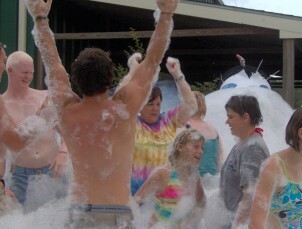 Have you ever played in a huge mountain of bubbles spewed from a bubble making machine? It was a highlight at camp. In other words, the environment is safe and the staff is trained and knowledgeable. It is an ideal opportunity and atmosphere for campers to explore interests, discover special talents, and stretch personal limits in a physically and emotionally safe environment. So, what did I learn from my experience at the Georgia Lions Camp for the Blind? Well, I came away with a new “can do” attitude after watching campers conquer new tasks. I learned to try to do things in a new way. I enjoyed being part of the community of visually impaired, realizing I was one of them for the first time which helped me accept my disability. I came away empowered to learn new skills to live with my blindness. Somehow, the kids instilled in me a new-found courage to move forward by watching their fearless approach to activities. I learned to play again and have fun in bubbles, water and mud. I played beep ball (adapted baseball for the blind) and loved it. I learned at the talent show that we ALL have talents. We celebrated and shared our unique talents and “abilities,” while our disability faded into the background. I was truly inspired by campers’ attitudes and accomplishments as well as the staff’s dedication to serve this population. My time at the Lions camp rivals my summer camp experience as a child. It was most memorable and life-changing. There are summer camp programs for the blind and visually impaired of all ages. Many schools of the blind have summer camps such as Perkins and Colorado School for the Blind. Leader Dogs for the Blind offers a summer camp program for teens which is free, including airfare. Lions Clubs International has special needs camps throughout the world. Everyone should experience summer camp at least once in their life. And you are never too old to go to camp. Who knows, you may come away with new confidence, courage, independence, playfulness, friendships and a spirit of adventure.